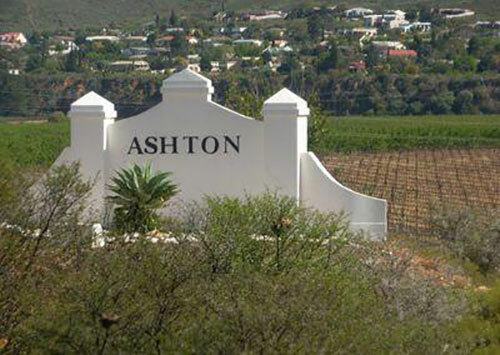 The town Ashton, famous for its wine and fruit situated in the heart of theÂ Robertson Wine Valley. Â The small townÂ below the majestic Langeberg Mountains, was once only a small trading post called Roodewal, a name given to the red slopes of the Langeberg Mountains . Roodewal became a railway station after the completion of the railway line from Worcester to Cape Town in 1887. One story is that the official that was sent here to take charge of the station had difficulty in pronouncing the name of Roodewal . He solved this difficulty by renaming the station to Ashton after his home town in England. The more probable story is that Roodewal was renamed in honour of Job Ashton. He Was the first director and railway engineer of the New Cape Central Railways (Ltd). Ashton is also at the start of the famousÂ Route 62Â which meanders through the Klein Karoo. Platform 62 Wine Boutique represents most of the top award wining wine cellars in the region. Wine tasting is done daily from 9:00 to 17:00. The Robertson Wine ValleyÂ is part of the largest wine producing region in South Africa – the Cape Winelands. It lies on the longest wine route in the world!